I loved being part of the two April shows, Shades of Spring and Art After Dark, but my goodness, that was quite a few weeks of prep work. It all turned out great, so totally worth it. A few sales, but the sweetest part were the great interactions with some very cool people. Thank you to everyone who came out. I took a little rest over the weekend, except for late Sunday, I cleaned up my equipment room. It was a disaster area, to say the least. Art supplies everywhere! But now they are all neatly organized again, ready for the camp season to begin in June. This week, I have some amazing artwork to photograph for a few fellow artists and I am so psyched! It is beautiful and it is such a pleasure to image it for their digital portfolios. Watercolors, pastels, stained glass, oils, acrylics and egg tempera icons will all be passing in front of my lens. It is like a boutique gallery in my studio, it will seem so plain when all that beauty returns to their homes. And it is hard to believe, but May is right around the corner. May will bring another show with ALOG, this time for several weeks at Bohrer Park, which will be lovely to be part of ... and a plus for me is that the pieces are ready because of April's work. And the Main Street Farmer's Market will be starting up on Saturdays ... I'll be there with my photos, jewelry, and some smaller artwork. And June, June is camp time! Last I checked, they were filling up quickly ... don't miss out, we are going to have some fun. Wow, it is hard to believe it is almost here ... and well, I am still busy painting ... ha, ha!! I wanted to have some fresh new things, right off the easel ... it just seemed to fit with the event. We are really thrilled about Art After Dark this Friday. The concept in general is so cool ... to have the opportunity to enjoy music and art together for an evening and I was honored to be invited to participate. I will have my large, abstract acrylic paintings with me. I am getting back into my foundations, and painting and drawing often again. Of course, I am not giving up photography, I love it, but it has been fantastic to be delving back into these other forms of creative expression. I took off the spring term from teaching, just to have this kind of opportunity to explore my own projects, and I am loving it. I can get so lost in the colors ... hours pass by before I touch back with reality. E. M. Spencer will be there playing their music. I have been listening to them on line and can't wait to hear them in person! All in all, it should be a great night ... if you are in the DC area, I hope that you will come on out and enjoy it with us. This will be at the Shades of Spring show at Black Rock, April 13-15th. I've had it printed on metal, with special matting/framing. Come check it out! With the first of the month rolling around and perhaps that you are checking your calendar, I thought I would share a few dates for upcoming shows in April. I would love it if you could drop by! I'll have a new painting and photograph, silver jewelry and notecards available. 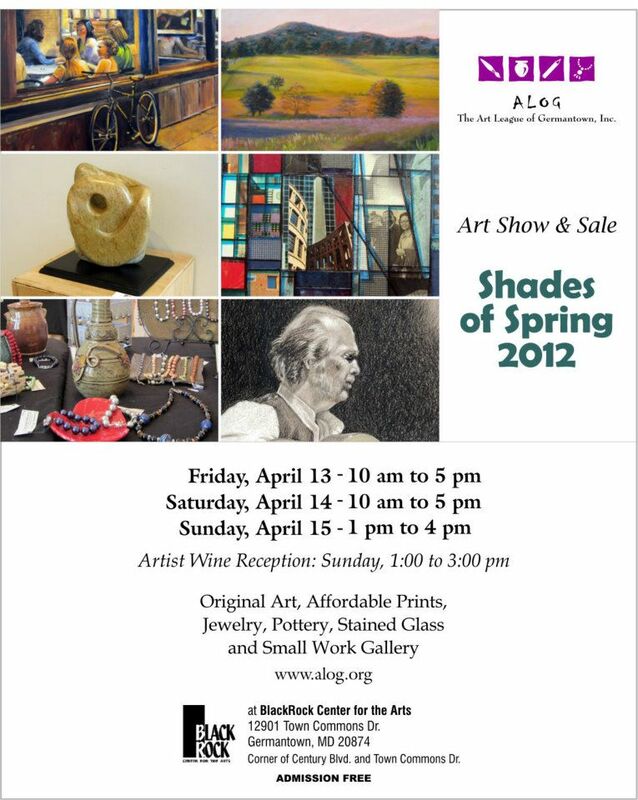 And I'll be there in person on Friday from 10 am to 1:30 pm and on Sunday for the reception. 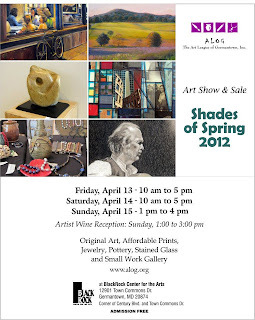 Friday, April 20, 2012 from 6 - 9 p.m. Admission is $10. Free eats, Cash Bar. 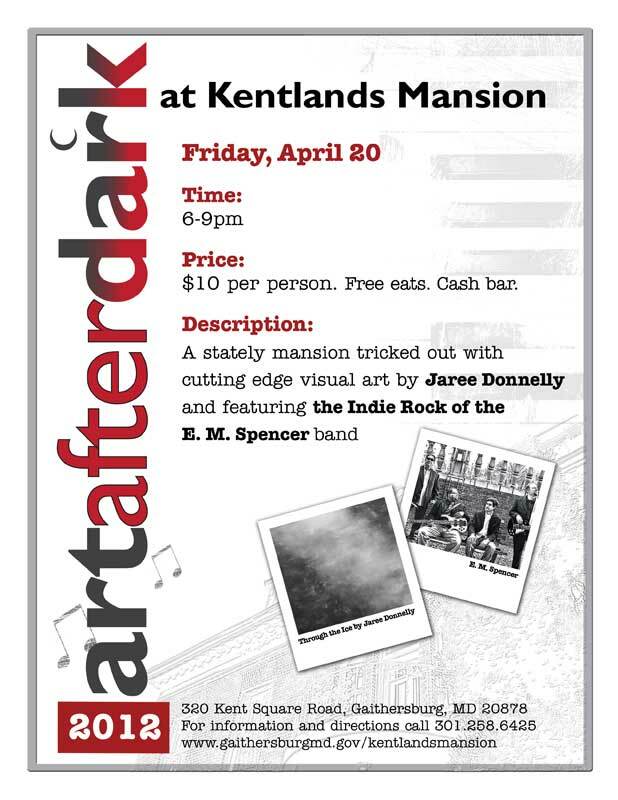 The indie rock band, E.M. Spencer will be playing. I will have my abstract paintings with me, plus I will be creating a new painting while we are there, and we are working on a few other surprises! It should be a fun evening.